J.Serge Sasseville has been with the Quebecor group of companies since 1987 where he has held previously various positions either as legal counsel or manager, including Director of Legal services of Quebecor Inc. and Corporate Secretary of Quebecor Communications Inc., Vice President, Legal Affairs, Corporate Secretary and Assistant to the President of Archambault Group Inc., founder and General Manager of the Archambault.ca e-commerce Web site, Vice-President, Legal Affairs and Secretary of Vidéotron ltée and Canoe Inc., President, Music Sector, of Archambault Group Inc. and Vice President, Corporate and Institutional Affairs of Quebecor Media Inc.
Telecommunications Association), Chairman of the Board of Directors of CPAC (Cable Public Affairs Channel), a member of the Library and Archives Canada Steering Advisory Committee and of the Boards of Directors of the Quebecor Fund, of the Banff World Media Festival, of the National Arts Centre Foundation and of the Lafontaine-Cormier Foundation. He is Chairman of the Board of Angèle Dubeau & La Pietà. He has been for 10 years a member of the Commission du disque et du spectacle de variétés of SODECand a member of the Board of Directors of Musicaction. He was admitted to the Quebec Bar in 1981. 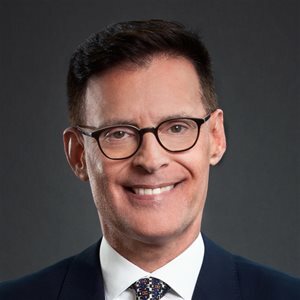 Before joining Quebecor, he has practised law as a litigator at the law firm Stein, Monast, in Quebec City, from 1981 to 1987.